CHICAGO - Human breast milk is sold for babies on several online sites for a few dollars an ounce, but a new study says buyer beware: Testing showed it can contain potentially dangerous bacteria including salmonella. 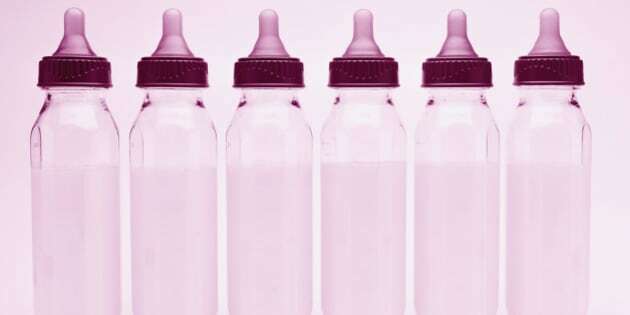 The warning comes from U.S. researchers who bought and tested 101 breast milk samples sold by women on one popular site, which over the weekend said it was making changes to its policies. Three-fourths of the samples contained high amounts of bacteria that could potentially sicken babies, the researchers found. The results are "pretty scary," said Dr. Kenneth Boyer, pediatrics chief at Rush University Medical Center in Chicago, who was not involved in the study. "Just imagine if the donor happens to be a drug user. You don't know." The research published in medical literature cites several cases of infants getting sick from strangers' milk. Breast milk is also provided through milk banks, whose clients include hospitals. They also charge fees but screen donors and pasteurize donated milk to kill any germs. With Internet sites, "you have very few ways to know for sure what you are getting is really breast milk and that it's safe to feed your baby," said Sarah Keim, the lead author and a researcher at Nationwide Children's Hospital in Ohio. "Because the consequences can be serious, it is not a good idea to obtain breast milk in this way." The advice echoes a 2010 recommendation from the federal Food and Drug Administration. "When human milk is obtained directly from individuals or through the Internet, the donor is unlikely to have been adequately screened for infectious disease or contamination risk," the FDA says. "In addition, it is not likely that the human milk has been collected, processed, tested or stored in a way that reduces possible safety risks to the baby." The researchers believe theirs is the first study to test the safety of Internet-sold milk, although several others have documented bacteria in mothers' own milk or in milk bank donations. Some bacteria may not be harmful, but salmonella is among germs that could pose a threat to infants, Boyer said. Sources for bacteria found in the study aren't known but could include donors' skin, breast pumps used to extract milk, or contamination from improper shipping methods, Keim said. The researchers attempted to buy milk from women on two websites but only tested milk obtained from women on one site, onlythebreast. An unidentified administrator for that site issued a statement saying the Incline Village, Nev.-based company is planning to stop informal milk sharing and will seek to improve donor screening and pursue "professional milk processing." The website appeared to be down Monday morning. There are many milk-sharing sites online, including several that provide milk for free. Sellers or donors tend to be new mothers who produce more milk than their own babies can consume. Users include mothers who have difficulty breast-feeding and don't want to use formula and people with adopted infants. Breanna Clemons is a donor who found a local woman who needed breast milk through one of the online sites where milk is offered free. "A lot of people are like, 'Ewww, it's weird,' but they haven't been in a situation where they didn't want their child to have formula," or couldn't produce enough milk, Clemons said. She said she shared her medical history with the recipient. Clemons is breast-feeding her 7-month-old and stores excess milk in her freezer. Every few weeks, she meets up with the recipient and gives her about 20 6-ounce bags. Clemons said the woman has a healthy 9-month-old who "loves my milk." Keim said it's unclear if milk from sites offering free donated milk would have the same risks because donors might be different from those seeking money for their milk. And in a comparison, the researchers found more bacteria in breast milk purchased online than in 20 unpasteurized samples donated to a milk bank. Bekki Hill is a co-founder of Modern Milksharing, an online support group that offers advice on milk donation. She said there's a difference between milk sellers and donors; milk donors "don't stand to gain anything from donating so they have no reason to lie about their health." Hill used a donor's milk for her first two children and plans to do so for her third, due in February, because she doesn't produce enough of her own. "Breast milk is obviously the preferred food" for babies, she said. Follow AP Medical Writer Lindsey Tanner at http://www.twitter.com/LindseyTanner .